Northmor players run onto the field during Senior Night last Friday. The Golden Knights won their eighth game in a row topping Mount Gilead. IBERIA — The final score of 42-8 doesn’t tell the whole story. Northmor (8-0, 5-0) was on the winning side of the ledger against KMAC and county rival Mount Gilead (0-8, 0-5), but the first half was nearly dead-even. “They came out with a great game plan. They stuffed us in the first half,” said Golden Knights head coach Scott Armrose, whose club came in ranked first in Division VI, Region 23. The first half saw the Indians control the line of scrimmage and locked in a scoreless tie until 2:30 remained when Hunter Mariotti connected with Gavin Ramos for a 15-yard touchdown. That came after Mount Gilead lost a fumble deep in its territory. On the night the visitors had 3 fumbles, losing 2 of them, and 3 interceptions. “I told them I was proud of their effort. We played tough and handled our blocking assignments,” Indians head coach Joe Ulrey said. Knights tailback Conor Becker, who entered the game as the leading rusher in the KMAC with 1,383 yards, ran for 213 yards on 11 carries and 3 scores. All but 8 of those yards came in the second half. Chris Bood had two interceptions and Blake Miller added one for Northmor. “It got away from us in the third quarter,” Ulrey said. “We weren’t squeezing like we were in the first half. We over-pursued a little with our inside backers and our D-line got washed away a little bit and those things led to some big plays for them,” Ulrey said. Becker had three of those big plays — scoring jaunts of 73, 85 and 33 yards — in the second half. The other one was a Hunter Mariotti to Cole Dille scoring strike that covered 64 yards. Dille caught 3 passes for 102 yards. Nathan Rogers went in from 5 yards in the closing 3 minutes and Brady Mermann added a conversion for the Indians. After a close win last week over East Knox, Armrose said his team had a good week of practice. The Knights visit Centerburg Friday night. “They are a good, athletic team,” Armrose said of the Trojans (4-4). 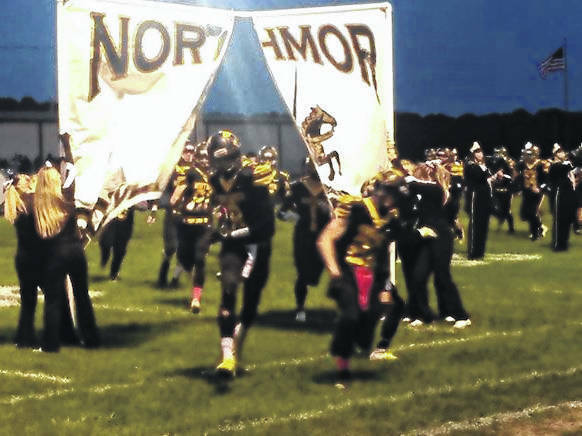 Northmor honored its 7 seniors — Dille, Ryland Thomas, Tony Martinez, D’Marcus Hudson, Kolton Yeater, Richard Vara and Bood — along with other fall sport athletes, band and cheerleaders during senior night. “They’ve shown really great leadership this year. I’d be happy to take any one of them home,” Armrose said. The Indians visit Danville (3-5), which blanked Centerburg 42-0. • Miller came in with 7 sacks and Brandon Planey 6 for the Knights and Cole Dille with 3 interceptions. • Northmor had 353 total yards to Mount Gilead’s 252. • The Knights committed 4 penalties for 50 yards; the Indians 2 for 25. • Rogers was 15-of-26 for 91 yards through the air. Mariotti 7-of-11 for 130. • Indians receivers Aaron Baer had 5 catches for 38 yards and Mason Mollohan 4 for 24. • Mount Gilead ran 64 plays to just 29 for the hosts. It also converted on 5-of-7 fourth-down attempts.